Tokyo, Japan, April 30, 2014 - Sony Corporation ("Sony") today announced that by independently developing a soft magnetic underlayer with a smooth interface using sputter deposition*3, it has succeeded in creating a nano-grained*4 magnetic layer with fine magnetic particles and uniform crystalline orientation. This enabled Sony to successfully develop magnetic tape technology that achieves the world's highest*1 areal recording density for tape storage media of 148 Gb/in2 (gigabits per square inch). This areal recording density is equivalent to approximately 74 times the capacity of current mainstream coated magnetic tape storage media, and makes it possible to record more than 185 TB (terabytes)*2 of data per data cartridge*3. Sony will jointly announce these results with IBM Corporation, who assisted with measuring and assessing the recording density of this new technology, at the INTERMAG Europe 2014 international magnetics conference to be held in Dresden, Germany beginning on May 4. *1As of April 30, 2014. *2When compared to a LTO-6 high-end LTO Ultrium format data cartridge utilizing a linear recording system (uncompressed). When converted to one LTO-6 cartridge. *3The sputter method is one form of thin film deposition. Electrostatic discharge is used to force argon (Ar) ions to collide with the material (target), and the materials generated from the collision become the thin layer deposited on the substrate. In recent years, the rapid recovery of data systems such as databases and data servers following natural disasters, as well as secure management of information has become ever more important, and companies around the world are proceeding to build new data systems. In addition, the expansion of cloud services and the creation of new markets to utilize big data have led to a growing need for a data storage media which can store large amounts of information. Magnetic tapes with a coating of magnetic powder measuring tens of nanometers applied to the top of the film are currently considered the mainstream form of tape storage media. LTO-6 high-end LTO Ultrium format data cartridges that are based on this technology utilize a linear recording system (uncompressed) and have an areal recording density of approximately 2 Gb/in2, with a total recording capacity of 2.5 TB (uncompressed). Until now, recording density of this type of media was increased by enhancing the miniaturization technologies that enable the size of magnetic particles on which data is stored to be decreased. Although coated magnetic tape is highly suited for mass production, the development of technologies capable of further reducing the size of magnetic particles in order to increase recording density in the future has become a significant challenge. Sony has developed a new vacuum thin film forming technology which is able to form extremely fine crystal particles with the aim of creating a practical, next generation tape storage media. This newly developed magnetic tape technology uses sputter deposition, a type of vacuum thin film forming technology, to generate multiple layers of crystals with a uniform orientation on a polymer film with thickness of less than 5 micrometers. Until now, when the sputter method was used to deposit a thin film of fine magnetic particles on a polymer film, roughness on the surface of the soft magnetic underlayer caused the orientation of the crystals in the underlayer above it to become non-uniform. This in turn caused non-uniform crystalline orientation and variations in the size of the magnetic particles (grain) in the nano-grained magnetic layer directly above the underlayer, and prevented increases in recording densities. 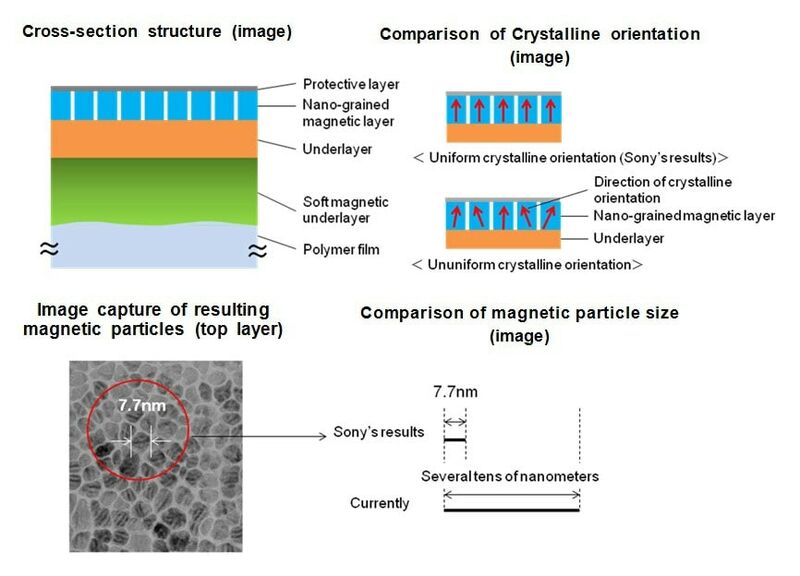 By optimizing sputter conditions and independently developing a soft magnetic underlayer with a smooth interface, Sony has made it possible to minimize disparities in crystalline length and growth. This enabled Sony to create a nano-grained magnetic layer composed of fine magnetic particles with an average size of 7.7 nm. When the magnetic tape created using this technology was measured and evaluated using an exploratory recording and assessment device, this new media was shown to achieve the world's highest areal recording density of 148 Gb/in2, equivalent to approximately 74 times the capacity of conventional coated tape media for data storage. Sony will continue to work towards commercializing this next generation tape storage media, as well as the development of increasingly advanced thin layer deposition technologies based on the sputter method, with the aim of increasing recording densities even further. *Any company names and/or product names mentioned in this document are trademarks or registered trademarks of the respective corporations.